Just because I am offering to work with some Facebook readers on meditation one-to-one does not mean the rest of you are going to miss a beat with the dharma postings. This is not an either/or, but rather more like a both/and sort of thing. In my life, the best English wordsmith I know of is William Shakespeare, but it is not just his choice and juxtaposition of words that strikes me. It is the clarity of his thought which he was so kind to share with us. The Buddhists offer this same kind of clarity and even more in my experience. Buddhist offer not only the clarity of thought from their tradition that we may taste, but, better yet, they also show us how to improve and clarify our own minds, something the Shakespeare only does indirectly. This fact is precious. Words are only pointers, pointing to what they mean, references beyond themselves. Words, sentences, and language itself depends on the sense it makes. If it is nonsense, it is meaningless – without meaning. If language makes sense to us, it is a sensual experience by definition. In other words, all language points beyond itself to the world of physical experience, essentially saying "go and experience for yourself." This goes for dharma instruction as well. Go and do it for yourself. See for yourself. Once we grasp the concept that all language is a simple referral to an experience we must personally have, dharma practice becomes easier. Buddhism is a do-it-yourself project. As Chögyam Trungpa said, and I like to quote him, "non-theism means nobody is going to save us." We have to do it ourselves. This is a big point or pointer! To the degree that we are looking outside ourselves for someone or something to enlighten us, we will be frustrated. Even the best teacher or a spiritual friend will very gently frustrate our looking outside, and kindly redirect our attention to the inside and show us how to awaken ourselves. There is no other way. That is what the dharma is, those do-it-yourself instructions. I feel devotion to my dharma teacher of thirty years not because he is a "great dharma teacher," but he is a great dharma teacher (with a great mind) because he was able to show me not his mind, but my own. I will tell (briefly) this story of when I first met the 17th Gyalwa Karmapa at his ancestral monastery at something like 15,000 feet in Tibet. I was sicker than a dog and on antibiotics due to my lungs not liking the high altitude when we were summoned to a private audience with the young Karmapa. I felt like 100-years old as I climbed the steep wooden ladders to his interview room (they don't have stairways like we do). At that altitude I was totally winded after just a few steps, and we had several ladders to climb. And I was a bit apprehensive because I had met so-called great yogis and spiritual teachers before and felt intimidated in their presence. I was about to meet what is called the "Golden Child," the same person that Eddie Murphy based his movie of the same name on. There are many details of the meeting with His Holiness I could relate, but here I just want to tell you of the effect of his presence had on me because it ties in with what I have written above. When I was ushered in and was sitting, along with my wife and family, in front of the Karmapa, it was not as I feared. It was not about him, but all about me. 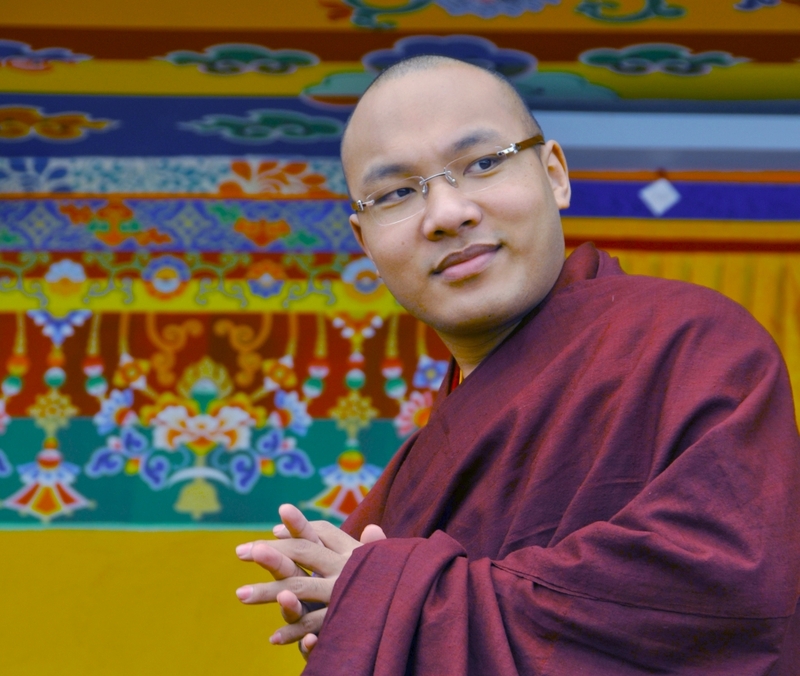 In his presence I realized for the first time not that he, the Karmapa out there before me, was a great being, but rather that I, way inside, was a deeply compassionate being. We all are, but we have to realize it through experience, which is part of why we practice dharma. Sitting there before the Karmapa, tears just poured out as I understood that behind my crusty personality, warts and all, was an incredibly sensitive and kind being. Wow! Who would have thought that was possible? Not me, of course. My point is that great beings like the Karmapa can help us realize ourselves, despite ourselves. And even less-realized beings like spiritual friends can help us turn things around and realize our inner mind. That is why we undertake dharma practice. And it works.